It’s true. The times have changed. Cannabis is in vogue now. The CBD craze. Edibles and topicals in chic packaging. We’ve even got a cannabis museum here in Vegas, and hopefully, we’ll have cannabis lounges in the near future. We expect Vegas’s 4/20 celebrations to be massive this year. But let’s say you’re not in the mood for a 4/20 night on the town. Maybe you want something a little more private, intimate, and low-key. If so, you should consider throwing a 4/20 dinner party. All of our major holidays — Thanksgiving, Christmas, National Hot Dog Day — feature food as a central part of the celebration. 4/20 should be no different. People have been pairing cannabis with food for thousands of years. 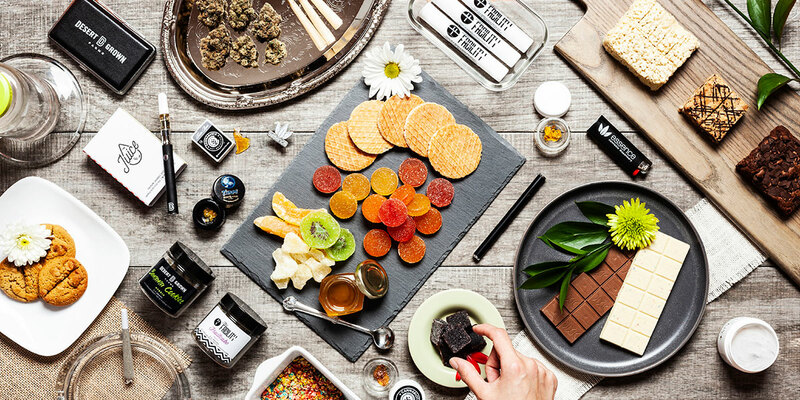 Think of all the fun to be had at a cannabis dinner party. Think of all the different dishes you could do! When people usually think of edibles, they think of brownies, cookies, chocolates, and gummies. But what about cannabis mac and cheese? Cannabis lobster? Cannabis tacos? Your friends probably already think you’re cool. At least…you’re cool enough that they’d accept an invitation to your cannabis dinner party. Now imagine the conversations that are going to take place afterwards. If you do it right, you’ll give them something to talk about for months. You’ll have that satisfying feeling of knowing that you put together an awesome meal that didn’t just taste great. It made people feel great too. The food didn’t just expand their bellies. It expanded their consciousness. It helped them forge deeper bonds with the people around them. It made them feel like life – this life right here – is really, truly good. Months from now, you’ll be hanging out with your friends, and they’ll be all like, “So when’s the next one? “The next what?” you’ll ask, even though you’ll know exactly what they’re talking about. Showing people a good time is its own reward. But having the reputation of a lit af party host doesn’t hurt either. The world is crazy right now. People are stressed out and uncertain about the future. We could all use a break. Communal dinners give us a chance to forget about our worries and enjoy each other’s company. Play games together. Laugh. Relax. And few things bring people closer than Mary Jane. So let’s show her some love and bring some quality medicine into the lives of our friends and family. Throw a dinner party on 4/20. Here are some tips to do just that. Invite people that you enjoy being around, i.e. people who are friendly and chill. Don’t invite people who are all drama or who like to start fights. In a room where everyone’s blazed, one out-of-control person can easily ruin the vibe…and the night. You can infuse cannabis into literally every single dish. You can serve infused and non-infused dishes. This might be the best way to go, because once the munchies kick in, your guests might want other options for food so they don’t get too intoxicated. You can also serve infused butters, sauces, and oils on the side so that guests can decide how much to apply to their regular food. If you’re going to have infused and non-infused dishes, let your guests know which is which beforehand. Be conscious of how much cannabis you’re putting in a dish so that you can advise your guests on how much to consume in order to get the desired effect. Make the setting comfortable. Dim lighting. Relaxing, chill music. If you have comfy floor cushions, blankets, and pillows, break those out. While your guests are waiting for dishes to be served, you can serve them pre-rolls as appetizers. Give them the option of a sativa, hybrid, or indica, depending on their mood. Don’t want people filling up your home with smoke? Use vape pens instead. Don’t smoke or eat so much that you’re not able to handle problem situations if they arise. Hopefully, you won’t have to deal with any problems at all, and you’ll be able to relax and have a good time. But you never know. Life is crazy. Things happen. So try to keep a lucid mind during the evening so that you can handle whatever business needs handling. The party is over. People had a great time, and some of them may be too intoxicated to drive home. If you’re comfortable with it, offer to let some of your guests crash on your couch, futon, mattress pad, sleeping bag, or whatever else you might have that could serve as a comfortable, functional bed. But if you’re more of a you-don’t-have-to-go-home-but-you-can’t-stay-here kinda person, encourage your guests to take a rideshare service home. In fact, it’s probably a good idea to mention your “Party’s Over, Now What?” policy in your initial invitation. Give people a head’s up as to whether or not it’s an option to crash at your place, or if everyone will need to leave your home by a specific time. That way, they can figure out how to plan for the end of the evening before they arrive, which will save you a lot of hassle. Well, you’re in luck because for the entire month of April, we’re offering our customers and patients special discounted deals on select products every single day. Visit any of our three locations — Las Vegas Strip, Tropicana West, or Henderson — so that you can take advantage of these April deals and be well stocked for your dinner party!